Few things get me extremely fired up and angry. But this is one of them… I have had numerous encounters with people online which have made me furious – what did they all have in common? Deliberately performing hypermobile party tricks. Bending body parts in ways that “typical” people can’t, just for kicks or for ‘show’. 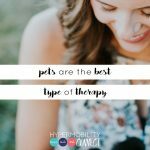 There is a reason why we teach kids with hypermobility from as young an age as possible that party tricks are not good for them, and are only to be performed once and only if requested, by a medical professional. There is a reason why I had to come up with a creative way of explaining joints and cartilage and soft tissue structures to 7-year-olds…. But perhaps it’s not only seven-year-olds who need the simple explanation. Before you read on, be warned, I have a rule. Once you know that you shouldn’t do something because of it’s potential to hurt your body, and then choose to do it anyway, you lose your right to complain about it. No whinging and whining about the pain, how stupid you are, how much you regret it. No complaining. There is no sympathy coming to you. You have to take responsibility for your actions if only for the sake of your future self. So why are party tricks bad? 1. It is pushing joints beyond their normal range. There is no way you can tell me that stacking your fingers of one hand over the top of each other to create a bridge effect is normal for anyone. We don’t do this movement in normal day to day activity. Just because a joint CAN move that way, doesn’t mean it should. Dislocating or subluxing a joint on cue – this is generally not a helpful behaviour, and in fact, it’s detrimental to that joint’s stability. If you do this, you need to stop. I urge you to do something constructive instead, like your physio/PT exercises. 2. It’s potentially causing microtrauma to the soft tissue structures in and around the joint. Microtrauma by its nature is undetectable to the naked eye; therefore you can’t SEE that you’re damaging yourself, but if you understand anatomy, you would be able to visualise it. Since not everyone has studied anatomy on cadavers as health professionals have, you’re going to have to trust us!!! We don’t know with absolute certainty, but we believe that this microtrauma may make us more susceptible to early-onset osteoarthritis. I don’t know about you, but I’m not willing to risk it. My current level of pain is sufficient for me. You can read more about Secondary Musculoskeletal Manifestations of Hypermobility Spectrum Disorders here 3. Microtrauma can destabilise joints and lead to macro-trauma – your dislocations, subluxations & ligament and tendon issues. Who wants more dislocations? Seriously. 4. Microtrauma and macro-trauma can lead to chronic pain. Need I say more? We only get one body. Some of our joints can be replaced, but they’re not the same as our own joints, and the recovery from those surgeries is not pleasant, not to mention the cost! We need to protect your joints as much as possible. I used to say to the kids I worked with “be kind to your joints”. Why do I have SUCH an urgent message about this? Because I had my first knee surgery when I was 12 (left knee), and my second when I was 13 (right knee). (These are MY actual images of inside my knees). THIS is what it looked like underneath my patella (kneecaps) – where there was meant to be nice soft cartilage protecting my bones. Instead, I was almost bone on bone in 12 short years of life. Trust me, you don’t want that. The pain of raw bone touching another hard bone is something I can’t describe and makes my medical-stomach-of-steel want to hurl. That was from 12 years of just being a kid. Playing sports, doing normal kid stuff and not knowing I was hypermobile. That was from my knees literally rubbing holes in themselves because of poor alignment. That is NOT what a 12-year-old’s knee is meant to look like. My surgeon at the time said it was the worst case of “wear & tear” he had seen in a child. I stand by my claim, one hundred percent. We need to be kind to our joints. When I was working with kids with hypermobility, I had to get creative with them to explain joints, and especially cartilage. I couldn’t whip out these images to explain to them, while it would have been most helpful, it wouldn’t have been appropriate professional behaviour! What did I use instead? A marshmallow. Yep, a giant marshmallow and a skeleton. Stick that marshmallow between two bones and with some imagination, you kind of have the idea of cartilage. If you bend and twist your joints in ways they’re not meant to move, you distort the marshmallow. You squish it. If you twist it the wrong way with enough force, you will actually tear the marshmallow (cartilage tear, which you can see in my scope images above, flapping away). 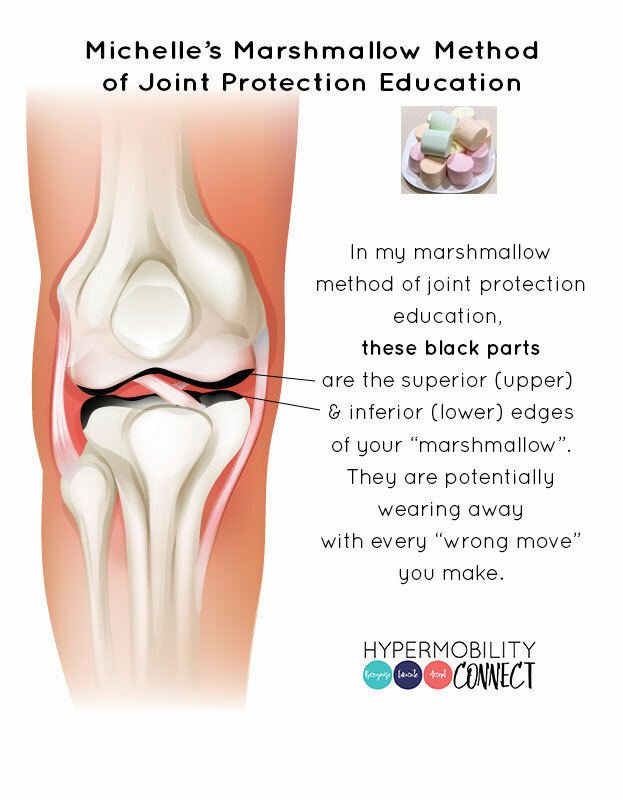 If you repeat the same abnormal movement over and over and over again (performing your party tricks, or assuming a poor posture repeatedly), you can start wearing holes in the marshmallow. If you hyperextend your joint enough, you further stretch any soft tissue structures that were helping to support the marshmallow and keep it in its rightful place. What you do with your joints matters, you just can’t always see it. You need to protect your marshmallows. You only get one for each joint. You need to use each one wisely. You need to do everything you can to make it last your entire life. Unfortunately for me, it was too late for my patella-femoral joint marshmallows (and my glenohumeral ones too), but I am working as hard as possible to do everything I can to protect the rest of them. Instead of encouraging each other to do things which are damaging to our bodies, let’s encourage positive behaviours, good postures. If you see a bendy person sitting in an unhelpful position or doing something that is significantly hyperextending their joint, tell them. Don’t nag them, just a gentle reminder. Maybe even a code word is necessary – but make it a fun one, like marshmallow so that they don’t feel like they’re constantly being picked on. (P.S. please make sure you have some kind of relationship with this person before you tell them they’re sitting badly, etc. No telling strangers that they must be hypermobile!! Not only will you get weird looks, but it’s also just not appropriate. Maybe read “Not All Zebras are Zebras” first). 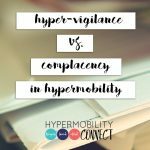 Let us reinforce when we see people who “can” hyperextend their joints, managing not to in the course of their daily activity! Awareness (and proprioception) is the key. Let’s support each other to look after ourselves. 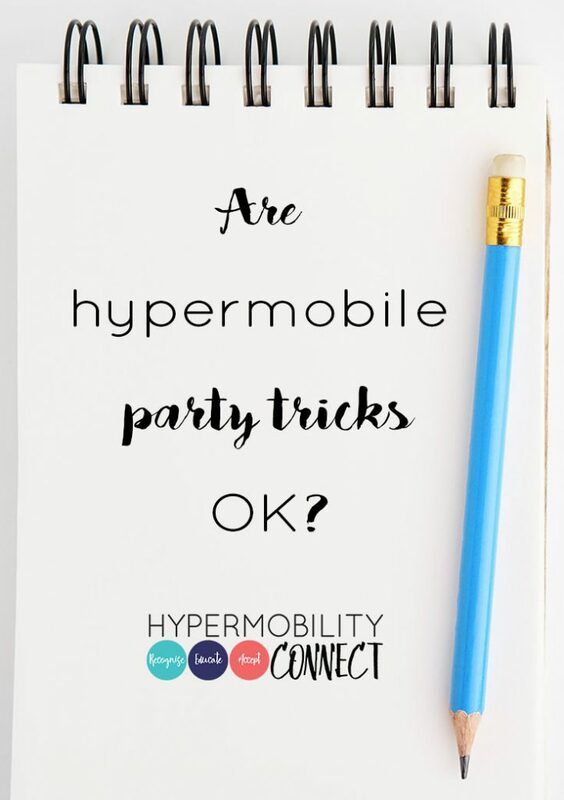 And don’t even think of posting photos of party tricks anywhere near Hypermobility Connect. We do not stand for damaging behaviours. We have zero tolerance for it. You & your posts will be removed from our social media.